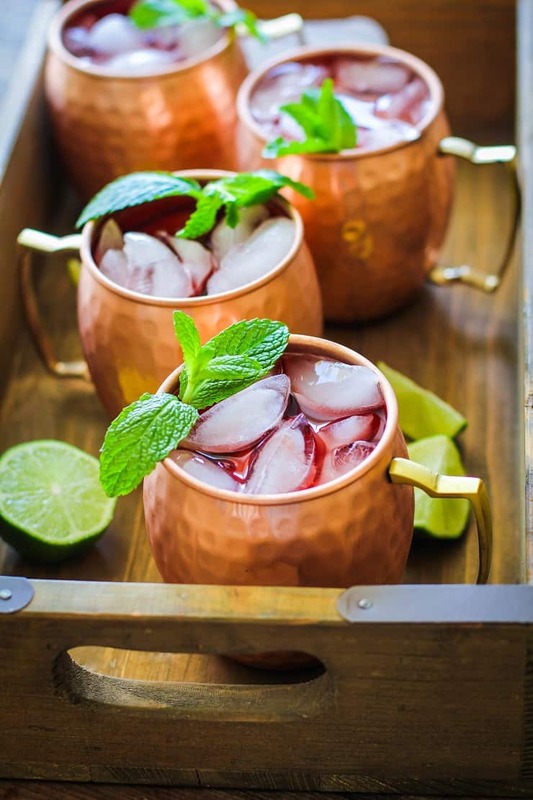 Fresh, crisp Strawberry Moscow Mules made with homemade strawberry simple syrup. 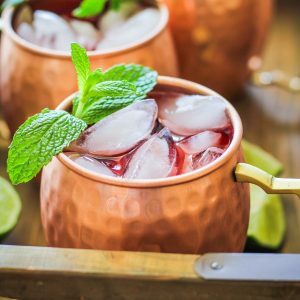 This recipe contains options for making a low-sugar Moscow Mule for those who are trying to lower their sugar intake. With summer and berry season upon us, I’ve been craving fresh and funky berry-infused cocktails. 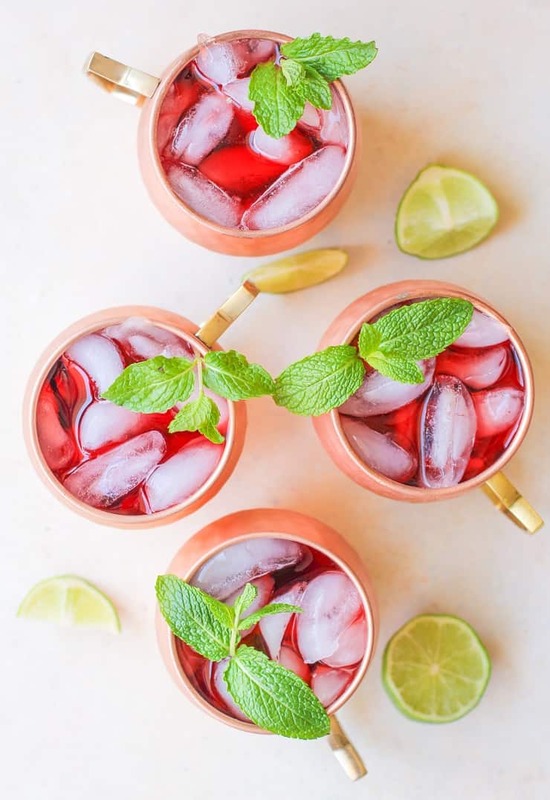 If you’re a fellow lover of the Moscow Mule, but you’re looking for a little somthin’ somthin’ to change things up, these Strawberry Moscow Mules are for you! 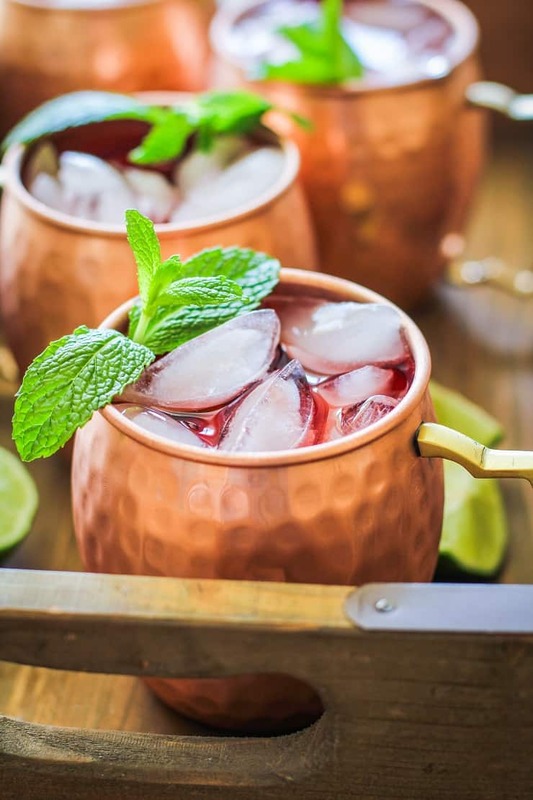 In case you aren’t familiar, a traditional Moscow Mule is simply ginger beer, vodka, and lime juice. This crisp and refreshing different take on the traditional cocktail includes a homemade strawberry simple syrup, which we sweeten with pure maple syrup (or coconut sugar) instead of cane sugar to keep it a little mo’ naturale. We add the strawberry simple syrup into the vodka, lime juice, and ginger beer concoction to make it extra frisky. Let’s talk ginger beer for a hot second. I’ve been making my own Homemade Ginger Beer for five years, and lemme just tell you, it will take your Moscow Mule steaze to next-level amazing. 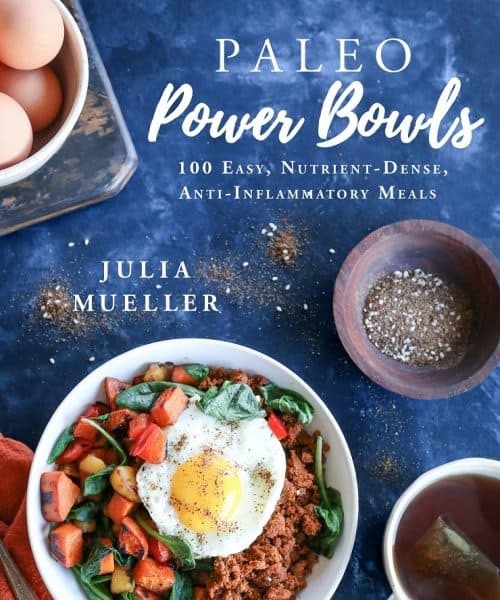 The recipe is actually still one of the most-visited recipes on my site! Making ginger beer homemade results in a super low-sugar ginger beer that is still full of sweet, tangy, gingery flavor but is actually quite healthful. 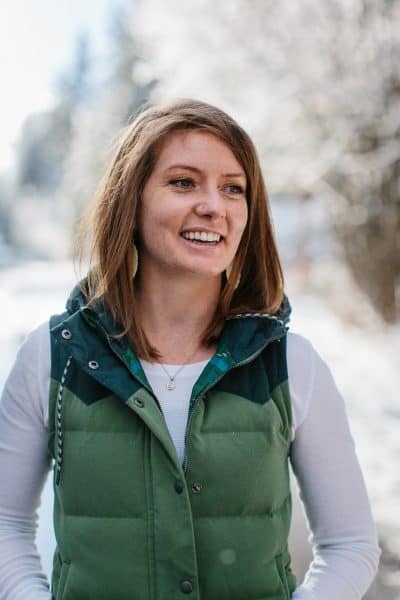 The recipe is made with yeast, which eats the sugar as it ferments, leaving you with a ginger beer that’s nice and fizzy and sweet while being much lower in sugar than the store-bought alternative. My recipe does require a couple of days because we’re allowing it to sit and ferment, so you’ll want to hop on this ahead of time. Combining the homemade strawberry simple syrup with homemade ginger beer makes for a delicious, fresh and crisp cocktail that is lower in sugar but still super pleasing to the ol’ palate. If you’re like me and you prefer your cocktails “skinny,” this is a pretty solid approach. You can absolutely go the store-bought route for the ginger beer portion, but just know there is always the option to make it homemade. There are also homemade ginger soda recipes that give you an immediate result (but still contain a lot of sugar), so bear that in mind as well. For the strawberry simple syrup, you have options as well. You can turn it into a traditional simple syrup by subbing cane sugar for the pure maple syrup, or use coconut sugar, honey, or coconut palm syrup. Simply substitute 1:1 for any changes you make to the sweetener. The exception would be if you’re subbing for a zero-sugar sweetener like xylitol, erythritol, Stevia, etc. For zero-sugar sweeteners, start with 2 tablespoons and go from there. Heat all ingredients for the strawberry simple syrup (except pure vanilla extract) in a saucepan over medium heat. Cover and bring to a full boil, stirring occasionally. When strawberries begin to soften, mash them with a fork. Reduce heat to a simmer and cook at least 10 minutes. Remove from heat and allow mixture to cool to room temperature. Strain through a fine mesh strainer, discarding the strawberry pulp or save it for a smoothie or muffin recipe. Store simple syrup in an air-tight container in the refrigerator until ready to use. Fill a shaker with ice and add the ingredients for one Moscow Mule. 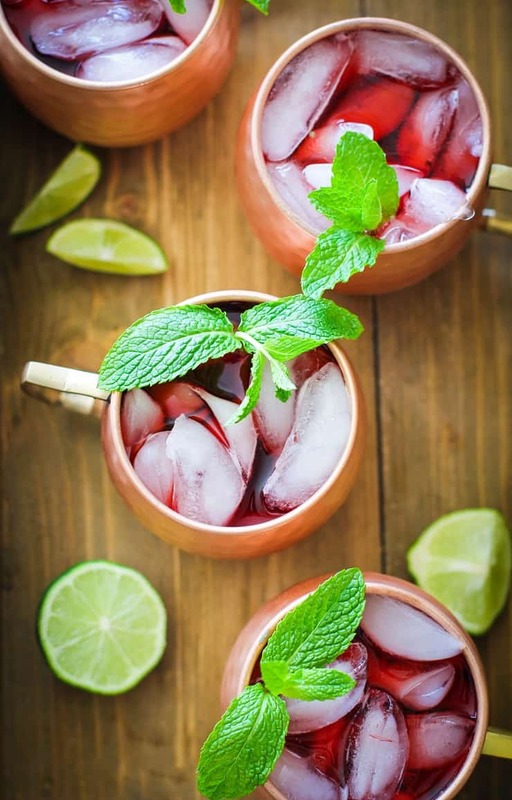 Shake well and serve in a copper mug filled with ice with a lime wedge and a sprig of fresh mint. YUM!!!! I cant wait to try this! I was just curious, didn’t know what a Moscow Mule was. It sounds refreshing tho!! I really like strawberries but these days I really scared about the parasites found in it 🙁 can you please suggest any alternatives for this recipe instead of strawberries? can I use watermelon? I seriously LOVE strawberries and also love making cocktails at home…much cheaper! Thanks so much for this recipe…perfect for summer entertaining!